Scott Grenney is our lead web developer with over 21 years experience in web design and 18 years of providing website solutions to small businesses. From makeovers to brand new websites, Scott will be able to provide a tailor made solution for you. With an extensive experience in web design and multiple portfolio examples, Eddystone Media specialise in creating modern WordPress sites to go hand in hand with your company’s branding and ethos. Functional, easy to navigate and eye-catching designs to suit your business. High quality photography, branding packages and printed materials also available. We include SEO as a standard in all of our website packages to give you the best possible start. Need help with updating or adding pages to your website? Perhaps you’re looking for a website refresh or a little tidy up to make it up to date? Our team is experienced in working with multiple platforms and can help you with many web related jobs, big or small. Eddystone Media can also convert your existing website into a WordPress site. Free training sessions on how to use WordPress are also available upon request to give you full control of your content. Eddystone Media also offer maintenance contracts for websites. From pay as you go – request updates when you need them, to monthly contracts – we’ll update upon request and we’ll add a number of agreed updates on a set time scale (perfect to keep your news/blog up to date). This allows you to call, email or text us with update requests, we’ll also make sure your website is backed up. We use WordPress, one of the most popular content management systems, which gives you the option to have a full control over your website. You can update and add pages yourself and make changes without needing to pay for maintenance fees or waiting for someone to make changes for you. No more out out of date information on your site, you have full control over your website content. WordPress also allows us to offer thousands of high quality, eye-catching website design templates and configurations to choose from and build upon. This makes the process of building your new site much quicker resulting in a significantly lower cost without having to compromise on the quality. All of our websites are mobile responsive and include initial SEO. WordPress training is available upon request. We have an extensive portfolio of websites. Feel free to ask samples of our work. Eddystone Media’s experienced team of writers provide a wide range of content and editorial services ranging from short blogs and social media updates to full size articles for web or print and press releases. Aside from having an in-house content team, we also work with some of Plymouth’s best professional freelance writers to ensure a wide variety of topics can be covered. Our team of professional freelance photographers offer a vast range of services for commercial and private use. Each of them has a unique style and specialty but they all work to the highest of standards and offer excellent quality images at very competitive prices. From product shots, pictures of your business to compliment your website, event photography, fully immersive 360 degree photographs to portraits and even weddings. We also hold a large stock of stunning pictures of Plymouth available to purchase for private and commercial use. We offer bespoke packages to suit your needs. To help you make the most of your social media efforts we offer. 1:1 or small group training sessions. Easy to follow, jargon free and with free email support after the training. Twitter, Facebook, LinkedIn, Google+. Have anything in particular you’d like to focus on i.e Facebook ads or using LinkedIn to its full potential? Get in touch now! Get advice from an experienced team member whatever’s your social media query. This is a great option if you would like a follow up to your training or are experienced in running accounts but seeking an opinion on the direction you’re heading or would like know how to make the most of your online presence. From one off meetings to monthly mentoring sessions, we can offer a plan to suit you best. Let us manage your Facebook and Twitter, engage with your followers, create quality personalised content to help increase your follower base and spread the word about your business. Monthly on rolling contracts, fully customised to your business’s needs. 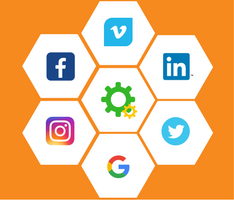 We take great pride in providing bespoke Social Media Management service and work with you to ensure your brand’s message is clear. 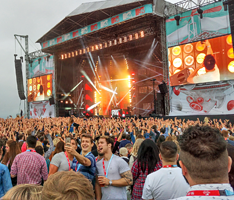 MTV Crashes Plymouth 2016 & 2017 – We managed the official social media channels for MTV Crashes Plymouth including answering questions, moderating and creation of media content posts live during the event. Worked closely with Plymouth City Council Events team backstage. 50,000 people attended the two day event. Respect Festival 2015 – We provided the digital media strategy involving revamping the festival website and keeping their social media channels active before and during the weekend long event. We help businesses of all sizes to connect and collaborate with each other. Eddystone Media are great believers that by working together we can achieve more, come up with fresh ideas, develop and learn. This is not only good for your business, but offers your clients more. Whether you are new to the area, a start up, freelancer or a well established local company, we can help you connect with other like-minded professionals to band together with and achieve more. From ideas to execution, we can help your business make an impact and stand out from other competitors. Whether you would like us to come up with creative solutions to promote your services, create a marketing strategy, social media and online campaigns that will keep your followers engaged, we got it covered. Need advice on how to make your Newsletters more effective? Perhaps you’d like to give your brand a re-fresh or need some help with an upcoming launch? We can support you every step of the way. Experienced in Events Media. We have a highly experienced team of writers, photographers and social media reporters, each of whom have covered numerous events from small scale events, including local art gallery exhibitions, to large scale events including National Armed Forces Day, the British Fireworks Championship and are media accredited with the Plymouth City Council Events Team. We can provide; a team to cover your event, written content and photography for you to use fully on your site or to be featured on another website. We also offer LIVE coverage via social media – the perfect way to interact with visitors to the event and to attract new followers online. 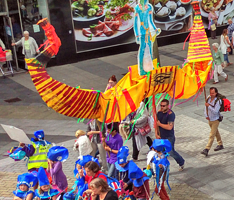 We are skilled at engaging with the public and local community to help bring a wider interactive dimension to your event. Helping to spread the word and increase awareness. We have an excellent track record when it comes to helping a business market a new product or service. We can offer a wide range of options and ideas to help increase your brands awareness. We offer a range of free training and support options. Our flagship community websites One Plymouth, Plymouth Barbican Waterfront and Plymouth Hoe Waterfront have a popular following and highlight what we can do for your community. The digital networks involving websites and use of social media and working closely within the local communities to give a unique neighbourhood feel. With over 11 years experience in online building community work, including 7 years via the Waterfront community websites we are perfectly placed to help built community based websites. We are also experienced in helping encourage volunteers to support your community website and have a mountain of ideas you can use to help build consumer/audience engagement through special offers and events. We can show you how to encourage people to talk about your community, spreading the word and more importantly actually visit it!